Built with input by Tho. 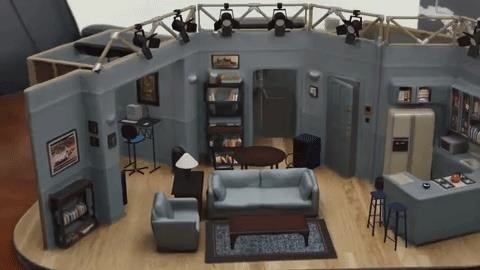 E. Azzari, the sitcom's original production designer, the Seinfeld Set Replica is a non-AR, very real miniature version of the TV set (minus the ever-present statue of Superman). However, the online store for the product gives customers the opportunity to preview the replica in their physical space through augmented reality via ARKit-compatible iPhones and iPads. The experience is made possible via Apple's AR Quick Look feature for web-based content through the Safari mobile browser, as implemented by Shopify. 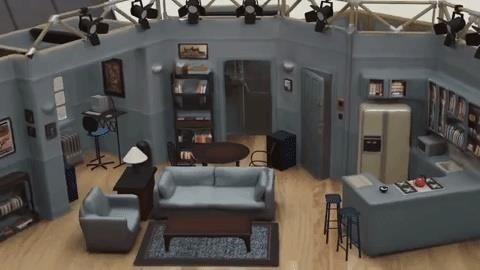 The detailed 3D model enables viewers to see Jerry's iconic living room and kitchen up close, though his bedroom and bathroom are, as usual, off limits. "With Shopify AR, you can not only view the replica in your apartment but move in to look at different details and take yourself on a tour of the set," said Daniel Beauchamp, head of AR/VR at Shopify, in a blog post. It's not real, but it's spectacular. And the experience is very meta — a virtual model of a real replica of a TV set built to look like a New York apartment. The intent is not only to give a thrill to Seinfeld fans, but also to help sell the memorabilia itself, which retails for $399.99. As such, the online retail experience demonstrates how Apple's AR Quick Look feature, and web-based AR in general, can level the playing field for smaller or independent retailers versus the AR-friendly e-commerce apps from bigger retailers like Amazon, IKEA, and Target. Similarly, viewing items like virtual Instant Pots and the Fallout T-51 Power Armor Speaker, rendered stunningly in Pixar's USDZ file format, appears to gives Apple's flavor of web AR a bit of a leg up on other platforms when it comes to startups and indie firms looking to leverage AR for sales.